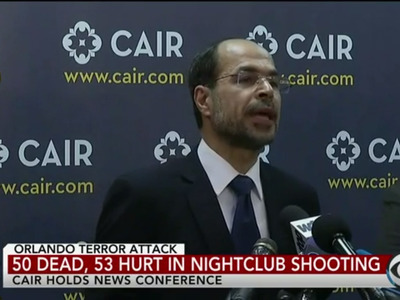 Screenshot/CBS NewsNihad Awad, executive director and founder of the Council on American-Islamic Relations, condemning the Orlando shooting in a press conference in Washington, DC. Muslim leaders across the United States are condemning the shooting that killed at least 50 people and injured at least 53 others in Orlando Sunday morning. The shooter, Omar Mateen, pledged allegiance to ISIS Saturday night during a 911 call, and a news organisation affiliated with the terrorist group has claimed responsibility for the attack. “You do not speak for us. You do not represent us. You are an aberration,” he said at a press conference in Washington DC. “This attack that happened in Orlando should not be used to vilify or stereotype peaceful, law-abiding Muslims in America. Islam absolutely condemns and forbids terrorism and extremism,” he said at the Washington press conference.